– Can you IMAGINE ….? – Do you SEE my point? The use of such words as PICTURE—IMAGINE—SEE my point—are deep reflections of how our minds process information that reaches us through our senses. We process ALL incoming information through IMAGES. Linguistic communication consists of the transmission of immaterial ideas or concepts from one person (speaker or writer) to another (hearer or listener) by means of material signs such as marks on paper or vibrations of the air waves. In reading a text, we undertake a process of vision whereby material signs are translated into concepts in our brains. The traditional interpretation of communication purports to treat the material sign as the mere appearance of an underlying ideal reality. When communication is interpreted in this way, the interplay of signs is not treated as a reality in its own right. Rather, the sign is taken as the signifier, indicator, or appearance of a signified essential reality which underlies it. This reality is the conceptual content which is somehow held in the brain of the communicating person. The heart in Ancient Egypt symbolizes the consciousness. As such, the information channeled via the five powers of sensation are brought to the faculty of the imagination whose physical dwelling place is the frontal lobe of the brain. The data gathered by the five senses—this intimate, received knowledge—is unified by the imagination. The imaginative ‘welding’ process does not follow the path of reason and logic. The mind amasses perceptual data and makes “sense” out of them. In turn, the imagination unifies in a similar, non-logical, manner. The imagination moves from one thing to another. Given many things of nearly totally divergent natures but possessing one-thousandth part of a quality in common (provided that it be new or distinguished), these things belong in an imaginative category and not in a gross natural array – that is, not in a collection of data arrived at by mere copying. 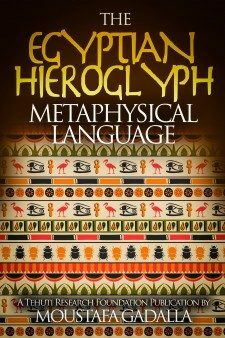 Language opened the new realm of spirituality where concepts, memories, and deductions became of decisive importance in contrast to lower psychical activity, which concerned itself with the immediate perceptions of the sense organs. It was certainly one of the most important stages on the way to becoming human. As such, representative true images in the mind/consciousness are the true realities of the universe. It should be concluded then that a full correspondence between consciousnesses and world exists. It is the transcendentalist consciousness which gives rise to the mundane heaven, again with the necessary additional feature to preserve it as heaven, that its occupants know that they are there. More precisely, they are certain of the correspondence between consciousness and consciousness, and so goes any possible consciousness; and so, the world.